Our award-winning basement waterproofing systems come with a written, transferable warranty! For a free, no-obligation basement waterproofing quote, call or e-mail us today! 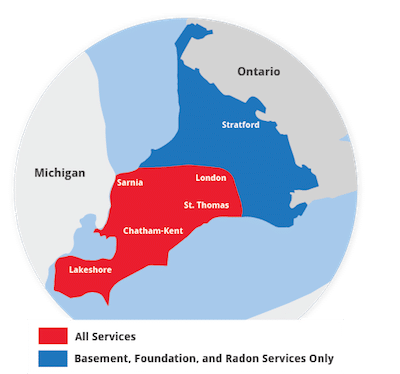 We proudly serve London, Windsor, Chatham, Sarnia, the surrounding areas of Windsor, Stratford, St Thomas, Leamington, Essex, Amherstburg, Strathroy, and many nearby areas. Disaster restoration experts are pros at drying homes, pumping out water, and making sure that mould and rot are controlled. Have them visit your home within 48 hours to avoid mould growth. Here's where we come in! If your home is located in the Southwestern Ontario area, we'll be standing by to help you. Since the basement could be humid for a couple days while the drying out process continues, you may want to move out personal items such as photos, documents, and fabrics. They may look fine now, but they could grow mould in the near future. You also may want to get a photographic record of the damage for your insurance company. When it comes to wet basement repair, we at Advanced Basement Systems have it down to a science. We'd like to meet with you and show you firsthand why we're the best in the business! For a free, no-obligation basement waterproofing quote, contact us by phone or e-mail today! We proudly serve the Ontario area, including Chatham, London, Sarnia, Windsor and nearby.